Sir Ponnambalam Arunachalam Memorial Lecture will be delivered today (9) by Sena Wijewardene, former president of UN Appeals Tribunal, at the Sri Lanka Institute of Tourism, Galle Road, Colombo 3, at 6 pm. Arunachalam was the youngest son of the three sons of Gate Mudaliyar, A. Ponnambalam. 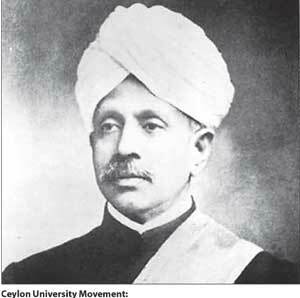 He was born in Colombo on 14th September 1853 and departed this life on 9th January 1924. The grateful people of Sri Lanka (then Ceylon) remembered him well by erecting his Statue in the grounds of old Parliament premises. It is inscribed therein “Sir Ponnambalam Arunachalam Scholar, Statesman, Administrator, Patriot, erected by a Grateful People in testimony of a life nobly spent in the service of his country and in recognition of his pre-eminent and signal services as the champion of reformed legislature and of his matchless devotion and steadfastness in the cause of the Ceylon University, 1853 – 1924”. He received his education at the Colombo Academy, a precursor of Royal College. His Principal at the Academy said of him, that “in my forty years’ experience in the instruction of youth, I have never met with any pupil who gave greater evidence of ability. Mr. Arunachalam’s conduct has always been most satisfactory and I consider him to be in every way a young man of the very highest promise”. In 1866 he was awarded the Turnour Prize for the most outstanding student of the school. In 1870 he won the English University Scholarship which enabled him to enter Christ’s College, Cambridge University. In the records of Christ’s College, he is described as a “brilliant mathematician and an able classics scholar”. Besides it, he was called to the Bar from Lincoln’s Inn. In 1875, he passed the Civil Service Examination. He was the first Ceylonese to “gain admission to the Civil Service by open competition”. He was the Father of the Ceylon University Movement. He realized the immeasurable good that a university could bestow on youth. He felt the absence of university education was an impediment to the national development of the country. In its propagation, he said “I have ever since felt that the greatest advantage of a University is not the book-knowledge you acquire there, but the breathing of the atmosphere of high culture and high ideals, the contact of mind with mind, the clash of opinions by associating with teachers and fellow-students and the stimulus thus given to intellectual and spiritual growth”. Many intellectuals wanted a university founded on ‘Western lines, giving all prominence to Western learning and thought’, but Sir Pon. Arunachalam along with his brother, Sir Pon. Ramanathan, wanted a university ‘with a distinctively national bias, giving special importance to the national languages, cultures, religions and fine arts, while at the same time enriching itself with all that was best and noblest in Western learning’. The outcome was the founding of the Ceylon University College in 1921. He was the first Ceylonese to agitate for elective principle. During the period of his service as servant of the crown, he wrote series of articles under pseudonymous name in support of an elected system without abdicating official control. It was the best of times as there was cordial relationship between the two communities. In 1919 Sir Ponnambalam Arunachalam whose leadership was unhesitatingly acknowledged by the Sinhalese Leaders of that time formed the Ceylon National Congress. Both communities were considered then as the two majority communities. Arunachalam strived to achieve national unity despite the fact that Sinhalese considered the Tamils as a minority community from 1922. Sir William Manning, as Governor was proposing constitutional reforms based on communal representation. Sir P Arunachalam resented them, as he was an ardent adherent of territorial electorates. However, many others took a contrary view. The Kandyans and the Jaffna Association stood for communal representation. The Kandyans under a three-man delegation met Viscount Milner, the Secretary of State for the Colonies in London on 22nd June 1920 and made representations that they should be treated as a separate community. The National Congress delegation led by Sir Ponnambalam Arunachalam met the Secretary on the following day. The Kandyan delegation successfully convinced the Secretary that the Kandyans were a minority community and that ‘the Congress was conserving the whole of the administrative power against the weaker minority’. The British who pursued a divide and rule policy readily recognized the Kandyan Sinhalese as a separate community. Sir Ponnambalam Arunachalam did not fail in his conviction and courage. He merged all the principal political organizations under one banner, and formed the Ceylon National Congress, in order to agitate in one voice to make the British to agree to their programme of reforms. He was the first President of the Ceylon National Congress and strove incessantly and inexorably to unify and consolidate Ceylon and the Ceylonese Nation.